I closed on the Bathroom Hole House last Friday. On Saturday I made a video that shows the bathroom hole. 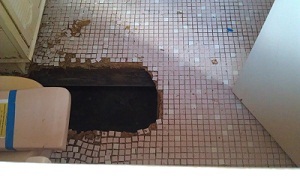 On Monday I met a contractor at the house and found that a vandal had broken in and repaired the bathroom hole. 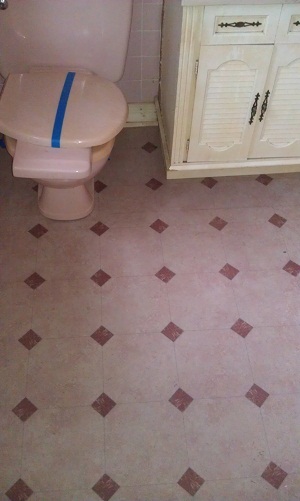 It appears to be fixed properly and the bathroom as new linoleum. I assume this fix was contracted before closing and the workers just got around to it after we closed. I found that wiring under one section of the house had been stolen. We also found that the bowing roof over the carport is happening because the wrong support beam was used. I do not have a good estimate for this fix yet. I have a formal estimate from my main contractor for $15,255 and my total purchase price with closing costs was $32,679.25. So, I have spent $47,934.25. That another $21,650 estimated. If this estimate holds I will be in the house for $69,584.25. My realtor suggested listing for $114,900 and the comps support about $117,000 based on sq/ft alone. I based my estimated on of $100,000. If it sells from $100,000 I will get $94,000 after commissions for a profit of $24,415.75. My carry costs will be about $700 per month and I expect to hold for 6 months so that’s another $4,200. In the end, I should make about $20,000. That will be a 28% return on the money spent in 6 months. The annualized return is more than double this and because most of the money is borrowed my return is magnified. I have financing lined up from a local bank. They will loan 80% of the cost up to a maximum of $70,000. I used cash to close, but will be pulling that back out with a construction loan from this bank. Then I will use that cash (and some I have) to do the rehab, with a final draw from the bank when everything is done. Great..they fixed your bathroom hole. That is a nice surprise…obviously the bank contracted this work before your purchase, but a nice bonus for you. Looks like a decent enough job. Did you have a chance to check the plumbing before and make sure they did not just cover up a big plumbing problem? Looking forward to seeing the final numbers on this one. Looks like you should come out good. What is the timetable? Ideally the work will be done in March or April and that should be a good month to get it on the market.